Sometimes lowbrow humor can produce high art. The Night Before is bawdy and irreverent, a stoner Christmas comedy that skewers everything from parenthood to celebrity worship to both religious and secular iconography. An expectant father smokes marijuana that causes him to envision his unborn daughter as an adult pole dancer. His friend is beaten up by drunk Santas. His other friend, a famous footballer, cavorts with a hippie chick who only wants to steal his weed. It’s uproarious, yet somehow coalesces as a yuletide film that references classics like A Christmas Carol and The Grinch Who Stole Christmas as well as postmodern holiday flicks like Die Hard, Home Alone, and a convivial jab at The Polar Express. The Night Before is far too ribald to join the perennial rotation of family Christmas films. But if you like your stockings stuffed with shrooms, then this is the movie for you. 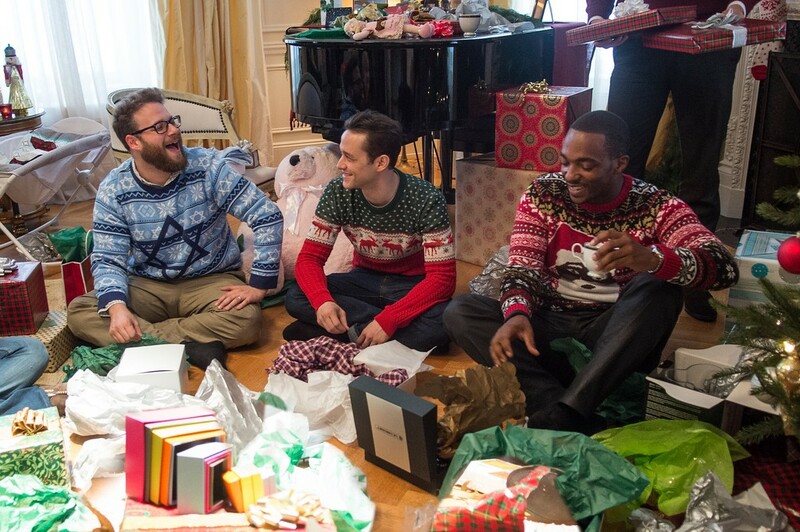 For the past 14 years, Ethan (Joseph Gordon-Levitt), Isaac (Seth Rogen) and Chris (Anthony Mackie) have reunited on Christmas Eve for an evening of revelry, a tradition started after Ethan’s parents suddenly passed away during the holidays. Today, Chris is a popular, thirtysomething footballer whose suddenly stardom stems from a syringe. Isaac is a lawyer facing impending fatherhood with wife Betsy (Jillian Bell). And Ethan still can’t cope with the breakup from his longtime girlfriend, Diana (Lizzy Caplan). On the occasion of their final Christmas Eve get together, Ethan pilfers passes to the mythical Nutcracker Ball, a secretive soiree somewhere in midtown. While waiting for directions to the party, the trio traverse their normal haunts: the piano mat at FAO Schwarz; a karaoke bar; Chinese food. Ethan trips out on the box of drugs Betsy bought off Craigslist and gifted to him, accidentally swaps cell phones (and “coke blood”) with Diana’s friend Sarah (Mindy Kaling) and happens upon a hallucinogenic Christmas Eve mass. Chris loses his weed to a Grinch-style groupie (Ilana Glazer) and doesn’t really want to run into his mom, while Ethan hopes to rendezvous with, and win back, Diana at the ball. Director Jonathan Levine jettisons the emotional complexity of his previous dramedies The Wackness and 50/50, which also starring Gordon-Levitt and Rogen. The Night Before is raw and ribald, placing it squarely in Rogen’s wheelhouse and reminding us that comedy is Gordon-Levitt’s strong suit. Mackie’s comic timing is sharp, but the real sardonic standout is Michael Shannon as Mr. Green, the boys’ past and present pot dealer who doubles as their intense guardian angel. Despite its plentiful pop culture ferences and literary derivations, The Night Before runs on the thinnest of plots, a deficit that emerges once it finally arrives to the big bash. The narrative comedown is accompanied by Miley Cyrus, a faux-crucifixion and James Franco’s Cheshire Cat grin. Still, the sunny denouement is a necessary detox from the preceding debauchery. The film is just funny—it doesn’t make much sense, but neither do many fables.